Whether you are planning to have an intimate wedding or an exorbitant one, Gurukripa Banquet will surely match your unique choice, budget, and requirements. With a capacity of accommodating up to 300 in seating and 800 in floating, the venue has a cosy and comfortable interior for the guests. It also offers an in-house team of caterers that puts all the efforts to delight the guests with mouth watering multi-cuisine dishes. Gurukripa Hall, Chembur, Mumbai have pillars decorated with delicate floral patterns, dark wood beams and plenty of glass windows lend the banquet hall an elegant ambience also make it a much sought-after venue in Mumbai. The venue is equipped to handle all of your event needs. Right from arranging a magnificent buffet with Indian and International delicacies to organizing the decor to creating the wedding you'd always envisioned - Guru Kripa Banquet Hall Chembur can do it all. It has a lush green lawn which can accommodate a huge crowd and is ideal for an open-air reception. 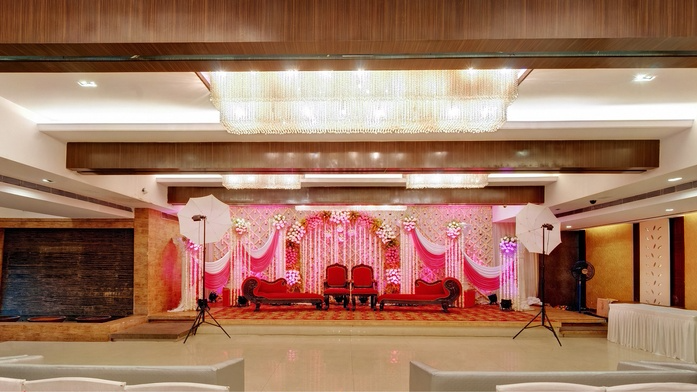 Gurukripa Banquets also has a banquet hall which is ideal for having a wedding ceremony. It offers complimentary changing rooms for the bride and the groom on their special day. Gurukripa Chembur serves a wide range of delicacies to choose from in both vegetarian and non-vegetarian food to their guests. It serves alcohol and also allows you to get it from outside. If you are looking for an overnight wedding venue your search ends here with Gurukripa Hall, Chembur, Mumbai.